Another one of my favorite sessions from NCTE14 was a panel presentation of Vicki Vinton, Fran McVeigh, Steve Peterson, Mary Lee Hahn, and Julieanne Harmatz. All of these presenters keep incredible blogs and I recommend following them. They are reflective, inspiring teachers, worthy of great admiration! "If we are not constantly asking ourselves what are the kids learning, then we're not being teachers." "The teacher is the chief learner in the classroom." "Is reading about listing facts or creating understanding? What is our goal in reading?" If you ever are passing through Iowa, try to make a PD session from Fran. You won't be disappointed. Hopefully, we will get her to present again next year in Minneapolis! Some of the students complained about taking too long to read a book and spending too much time talking about parts. I can definitely understand these feelings, as I am one who is known to inhale great books. However, those students can read ahead and then listen to the book a second time with no harm done. Read aloud is truly an incredible time to not only teach important reading skills, but also bond as a community that shares a literary journey. One of my favorite stories that Steve shared about the connections that kids make in his classrooms came out of a recent informational article about invasive beetles that destroy trees. Through questions and conversations, the students connected the beetles to people who invade communities and destroy other people. Wow! Steve's teaching emphasizes the fact that all information articles come from and create stories. Another important aha!!! I would love to have any of my daughters in Steve's classroom because he is so committed to letting his students lead the learning. To experience a unit in his classroom, check out a recent post he has written about his class's weather unit. Love the concept of leading with questions, a concept that relates so beautifully to Fran's presentation about the capacity for wondering. "I could write some great retroactive lesson plans!" That being said, I'm sure that the lessons that Mary Lee writes ahead of time are great, as well! The message from all of these presenters was so loud and clear that our classrooms should be full of inquiry and children leading the learning with questions and wonder. They have all written incredible posts refelcting on this session. You can start with Mary Lee's reflection here. Also, continue conversations about this session with the hashtag #teacherswonder. I'm sure that they would love to see you there! One of my favorite moments of NCTE14 was being in a roomful of educators and listening to Jacqueline Woodson read Each Kindness out loud. The whole book. Out loud. To us. How great was that! But, this read-aloud experience was only a small part of the powerful presentation that Ann Berger-Knorr, Mary Napoli, and Susan Van Zile put together that showcased Jacqueline Woodson's books. These presenters had collections of powerful picture books at every table. As we went through their jigsawed, interactive activity, we learned about the six elements of social justice: Self love and knowledge/identity; respect for others/empathy and kindness; social injustice; social movements and social change; raising awareness, and; taking social action. Grace Ahn has written a short post that gives each of these elements more description and can be accessed here. These presenters have given the world a gift with their collections of text sets that support each element, and they have made their presentation accessible to everyone here. As adults, we read the books that were on the table, then presented them to each other, recognizing and discussing themes and universal messages that lived within the books. The presenters had color-coded the sets, and our table's collection of books emphasized the second element. We shared Each Kindness, Every Human Has Rights, Paths to Peace: People who changed the world, and A Little Peace. If anyone wants an amazing poem to go along with Each Kindness, check out "Drop a Pebble in the Water" at www.ripplemaker.com/pebbles.htm. Note: I spent extra time looking at A Little Peace. This book could find its home into curriculum in many ways, since the photographs are from around the world, depicting varying levels of technology, available resources, communities, and geography. It's a book that inspires wonder and research with beautiful photographs and minimal text. This activity would work with a range of ages as an inquiry lesson, having students explore the question of what all of these works have in common. 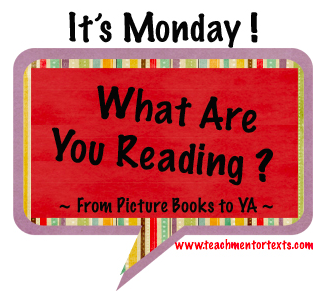 This question could anchor the text sets for all of the social elements. I wonder if children could come up with the six elements if provided these text sets. "What better way to lead students to become socially responsible citizens than to arm them with the thinking skills they need to raise moral and ethical questions about contemporary issues in the interest of justice and fairness?" While I can't duplicate the experience of listening to Jacqueline Woodson, I can pass long the access to text sets, blogspots, lesson plans, and resources from the session, Multicultural Text Sets: Landscapes into Stories and Writing. You won't be disappointed. More to come from NCTE14 in the future! Thanks to Stacey, Dana, Tara, Betsy, Anna, and Beth, the amazing writers and thinkers who host the Slice of Life community every Tuesday. Everyone is welcome to join with posts or comments at twowritingteachers.wordpress.com! I am still overwhelmed by the experience of having attended NCTE over the weekend. As a first-timer, I wasn't sure what to expect, and now, I'm not sure how to process, share, and grow from all of the knowledge, reflection, and challenges that came at me over a 72 hour period. For the time being, I have mined some of my notes from the conference for some of the great quotes that I wanted to remember. Most could be found on twitter, but sometimes it's nice to read great lines in different places. I am sharing them here in no particular order. Every line could probably turn into a blog post--I know that I have plenty of material to write about over the next few weeks. There were hundreds of lines that warranted repeating, tweeting, celebrating, and shouting out. Over the next few weeks, I will write about these lines, sharing the context, meaning, and substance behind them. For now, enjoy them as thought provoking statements that inspire conversation, debate, celebration, and wonder. I had some head-down-in-a-book time over the weekend, as I was traveling to Washington DC for the NCTE conference. (If you ever get a chance to go, take it! More to come...) At the conference, I was also introduced to some books that I didn't know, so...here's what I've been reading! I was honored to get to spend time with Margaret Simon who many of you might know from her blog, https://reflectionsontheteche.wordpress.com/ She gave me a copy of her book, Blessen, which I read cover to cover on the way home. Blessen, the main character has a voice that reminds me of Summer in Missing May. With clear, insightful, and honest reflections, Blessen pulled me right down into the back yard of her Louisiana FEMA trailer and into the middle of her story. So much importance happens in this short text that it offers opportunities to talk not only about plot, but also of guilt, responsibility, truth, lies, decision-making, and love. Additionally, students will be inspired to learn about Hurricane Katrina and its aftermath, as well as racial and cultural tensions that exist in our country. Half a Chance by Cynthia Lord is a beautiful story for upper elementary students about transitions, insecurities, kindness, perseverance, doing the wrong thing for the right reasons (is that the wrong thing, then? ), teamwork... Oh, and did I mention the passages of inspirational writing? Cynthia Lord gives a powerful lesson on bringing readers into the world of the story with passages like this: "Ansel's nose twitched at the unfamiliar lake smell: weedy and a tiny bit fishy. Out in the middle, the water was sparkling-pretty, like someone had spilled a whole bottle of glitter out there. But up close, an icky border of bright yellow pollen floated along the lake's edge. Beyond the pollen, a school of tiny minnows swam along, shifting directions quickly. This way! No, that way! Who's in charge here?" Can you imagine the possibilities for teaching the weaving of action, description, dialogue, and inner thinking in this passage? And this is only a small sampling. When I got home, I had to finish The Storied Life of A.J. Fickry by Gabrielle Zevin. People had blogged about it over the summer and it had been on my TBR stack for a while. While this is NOT a book for elementary students--there are a couple of intimate moments along the lines of A Fault in Our Stars-- I would want my high school daughters to read it and I would want them to not only enjoy the plot and the close reading that some clever twists require, but also the literary references that run rampant throughout the book. What a great book for a study group or a book talk! I loved hearing about innovative ways to integrate poetry into our reading and writing workshops. Pucks, Clubs, and Baseball Gloves by Catherine Ipcizade is a book of sports poems with lots of nonfiction text features. There are several different types of poems, many with strong small moments, super show-not-tell descriptions, and lists of verbs. Read the poems, teach the skills, inspire the athletes or even the imaginative players. So fun! Melanie Swider's students have been working their way through integrated social studies, information writing, and nonfiction reading units and they have been writing pieces about specific explorers. Many of the lessons have been about structure, organization, text features, and the research cycle, but, by looking at their pieces collaboratively on Google Drive (shout-out to Google Drive as a collaboration tool! ), we decided that they would benefit from a lesson about incorporating geographical terms and awareness into their pieces. Many of their pieces mentioned the places explorers went with no orientation for the readers. Melanie Swider videoed herself speaking through the components of a classic minilesson complete with a connection, a teaching point (information writers use important vocabulary when they are writing to teach readers), a place for active engagement, and a link to the work that they were doing. For this first experience of flipping, Melanie broke the video up into four parts, totaling about five minutes in all. Melanie Meehan had a lot of fun with the video and the students because we wouldn't let Melanie Swider talk as the rest of us watched her lesson. The goal for the students was not only to learn the teaching point, but also to learn how to interact with a video. Therefore, Melanie Meehan stopped it in several places, reminding the students to take notes. They have watched their teacher create charts enough in her lessons that they were able to create some pretty impressive charts in their notebooks. How powerful for them to watch their teacher, take notes on a lesson, and have the tracks of their learning right there in their notebooks! 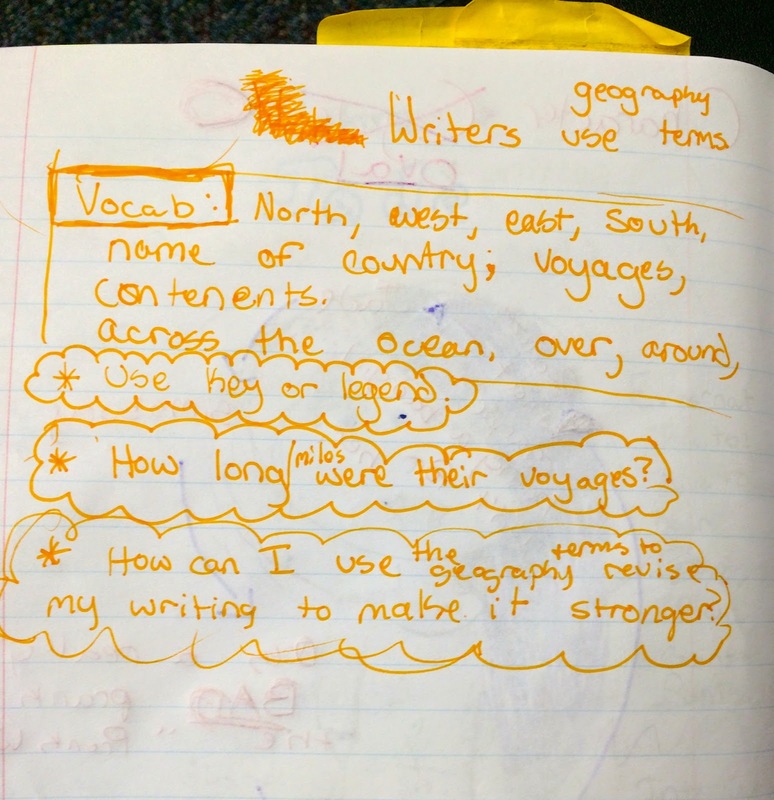 Below are examples of notes students took while watching the video lesson on including geographical terms into their writing. 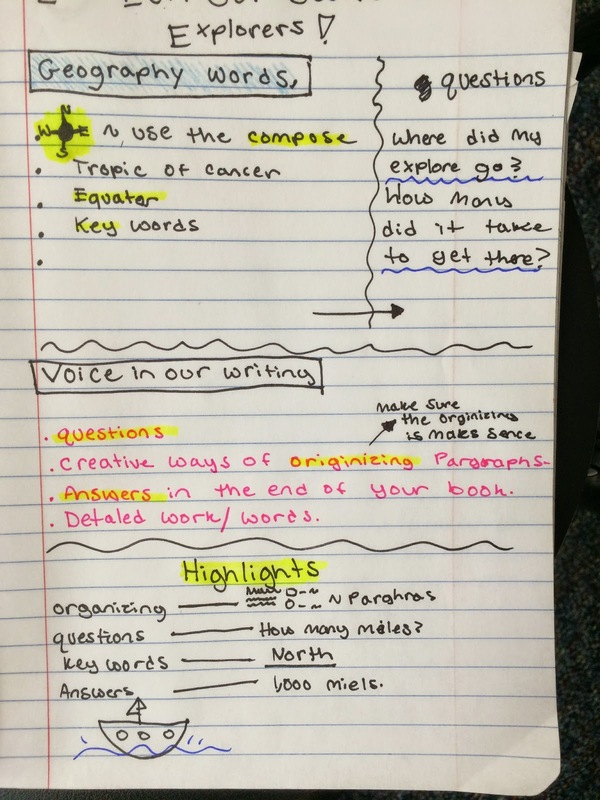 As you can see from their notes, students truly internalized the teaching in the video, were able to determine which parts were important to jot down, and were able to clearly organize their notes using various note-taking forms. After the lesson, students used their notes to help them revise their informational writing pieces by including geography terms to make them stronger and clearer to the reader. As students wrote, they had their notes out from the video lesson as well as the map they labeled in a previous lesson to use as a reference. Our goal is to provide students with a few more opportunities to interact with a video of a minilesson all together, before assigning this work for homework. Then, the homework check will be the notes that they create in their notebooks, and the work of the workshop will be the greater challenge of integrating their new learning into their writing. Stay tuned! If anyone else has tried flipping elementary minilessons, we'd love to hear. We'd especially be interested in the platforms that you are using, as we are still trying to figure out the safest, easiest way to provide access for students who are under thirteen years old. Slice of Life is hosted by the inspiring community oftwowritingteachers.wordpress.com. Everyone is welcome to read, post, and comment every Tuesday. Feel free to stop over and join us! This morning, I guest-taught in a second grade class. I have worked together with this teacher since the beginning of the year. so I am familiar with most of the students in her class, making it easier for them to be honest and reflective. My lesson was all about reflection and setting goals and I was so impressed with these young students' growth mindsets and perseverance. I took the language for this chart from the Teachers College Grade 2 Writing Checklist, so it would be easy to transfer the skills to other grades and genres. As I taught the lesson, I challenged the students to think about where they stuck. When two students raised their hands that they couldn't think of a story, I honored them and they worked with their classroom teacher to think of a story as I continued. Other students then felt braver to let on that they weren't sure how to plan across the pages, so they became a small group. When two students shared that they wanted to choose strong words, I suggested that they might want to partner up and inspire each other. That concept inspired more students to want to work on strong words. Nothing like the lure of collaboration! As they went to work on their stories, I continued to ask students what their goal was for the day, referring back to the chart. Some of them chatted about the evidence of their work during the mid-workshop interruption, and others stayed with one of the first two steps until they felt more comfortable at thinking and planning quickly. My favorite part of the lesson was at the end, when I asked the students to write down their goal so that they could remember what they were working on tomorrow. As you can see, they were serious about their work and they identified different work for themselves. Also, because they wrote it down and kept it with their pieces, their classroom teacher should have an easy time initiating conversations about how their work is going and what they plan to work on. I am looking forward to hearing about how students in this classroom continue to set goals for themselves. Once they learn that we can celebrate not understanding as long as we set goals and work to achieve them, the rate of powerful learning really, REALLY grows. 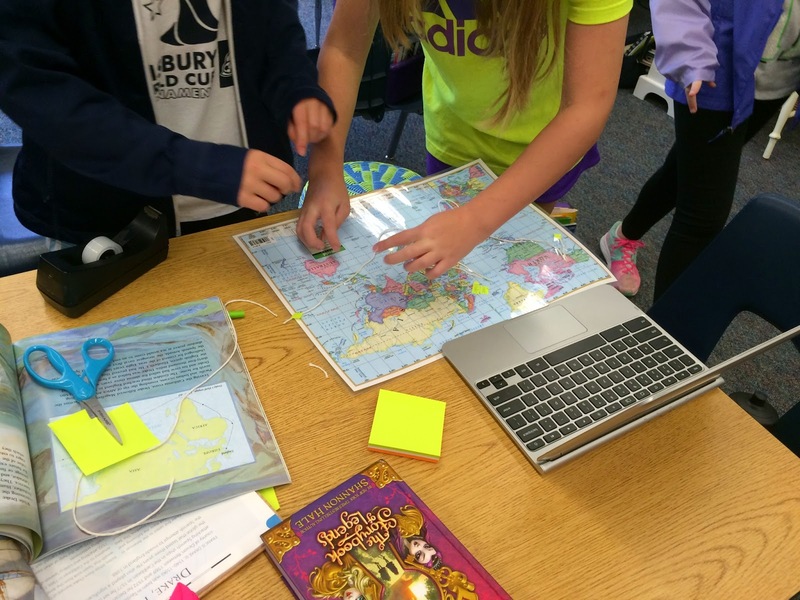 In addition to those key teaching points, I have also taught them how to use maps to truly understand where their explorer traveled on their voyages, which routes they took, and what they were in search of discovering. 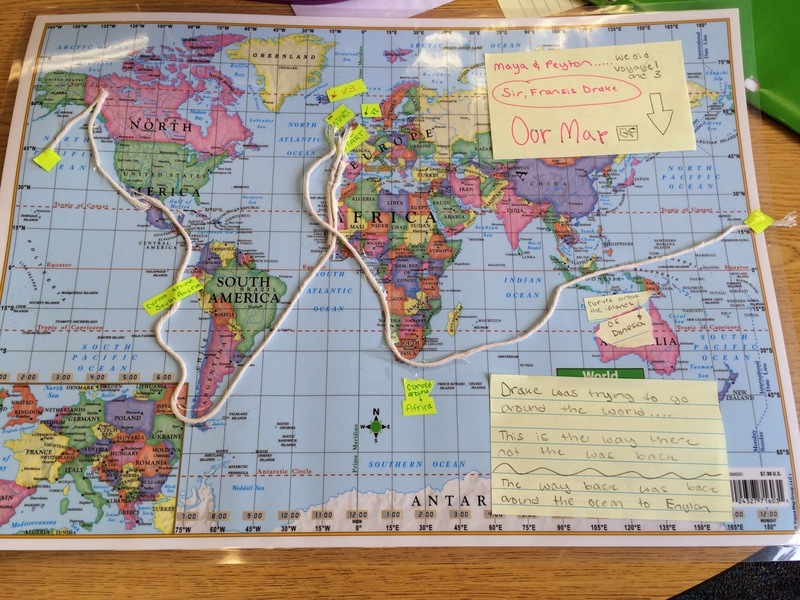 Since Melanie Meehan and I have been trying to get students actively involved in this unit through inquiry lessons and hands-on experiences, I decided to have partnerships work together to mark the voyages/routes on large maps using post-its and string. I asked students to choose a partner who is studying the same explorer and to take one map per partnership. 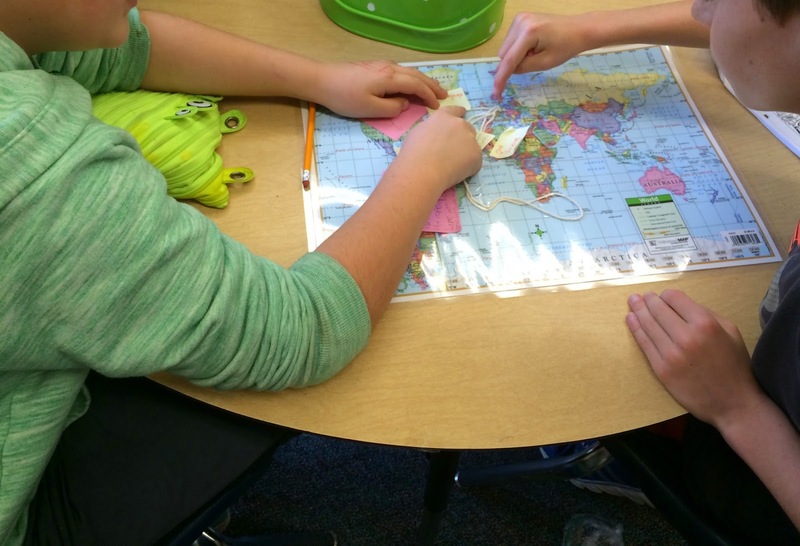 With their partner, they were asked to use post-its and/or string to mark and label their explorers voyages and routes on their map. I also told them they needed to be ready to share their maps with their classmates in a gallery walk the next day and be prepared to explain their markings/labels. Below are photos of partnerships working together to mark their explorer's voyages/routes on their maps. As you can see, students took out books, chrome books, and their notes as resources to help them with this task. They discovered they needed these resources on their own. As partnerships saw others taking out and using various resources, that sparked other students to utilize resources too! 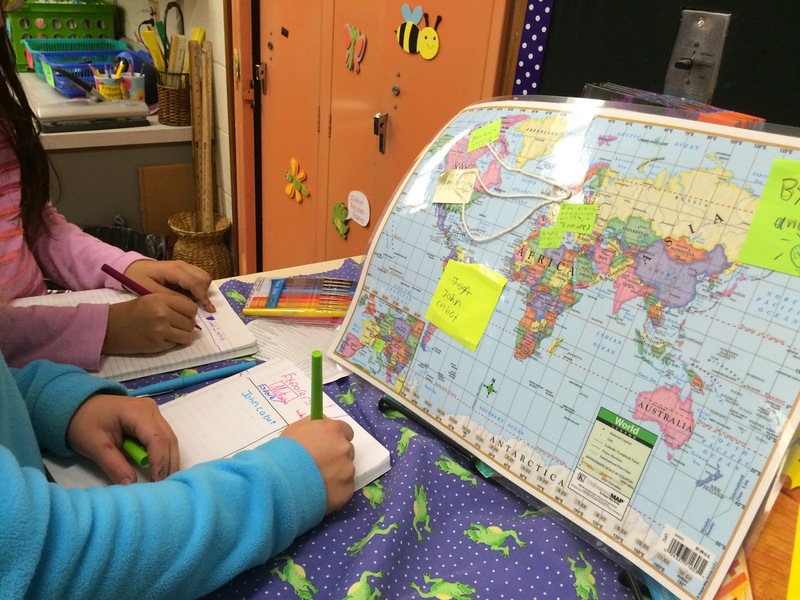 After students completed the task of marking the voyages/routes on their map, students shared their work in a "Gallery Walk." Partnerships went around the classroom, armed with their notebooks to take notes, looking at their classmates' marked maps. 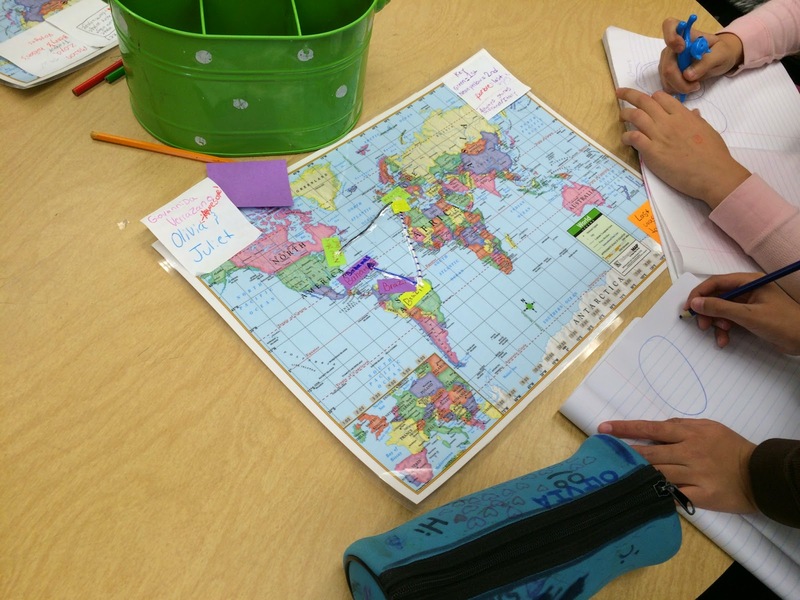 As students looked at and analyzed the maps, students jotted down their observations and questions they had for their classmates. Below are photos of students taking notes during the gallery walk. After the gallery walk, I gathered students together to provide them with the opportunity to honor their classmates' work as well as ask questions of parts that may have been unclear on the maps. 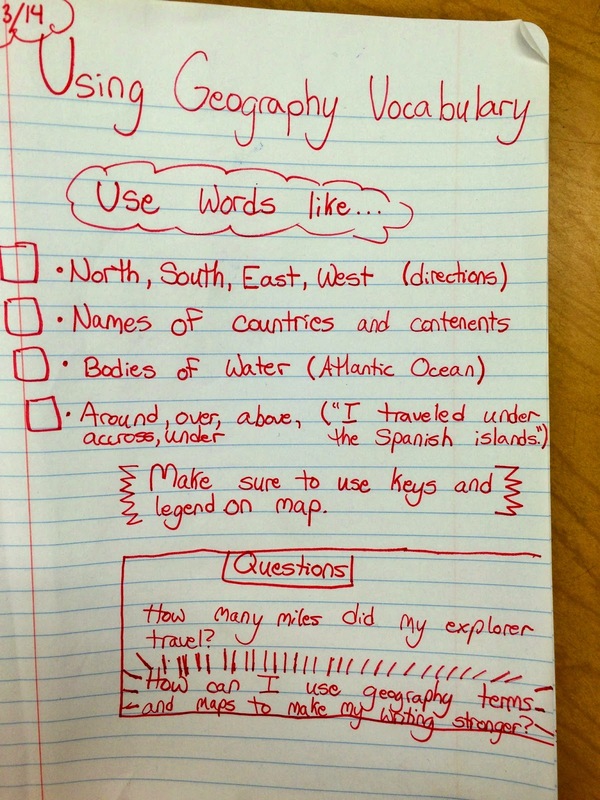 This was a powerful share since students had to internalize the information in order to teach their classmates about their explorer's voyages as well as reflect on and revise their maps based on their classmates' questions and feedback. This partnership work with the maps was a perfect segue into our next lesson on using geography words in our informational writing, which was the first time we tried a flipped lesson! Stay tuned to hear about that lesson next! I'm sad to admit that we struggle to fit in social studies, especially in fifth grade. Science is a tested subject in our state, so we have a significant amount of curriculum to cover. Additionally, the Common Core math standards have challenged the balance of instructional minutes in fifth-grade. In order to cover some of the social studies, we integrated the Age of Exploration with Nonfiction Reading and Information Writing. Basically, we want students to learn, among other things, that we can read to learn and we can write to teach. Students completed their narrative writing unit for a couple of weeks while they began to research and learn about specific explorers during social studies. Then, when we were ready to launch the Information Writing unit, the students had a set of notes and some knowledge about an explorer to write about. One of our goals is to have students work harder than we do, so on the first day of Information Writing, we told students that we were not giving a mini-lesson. Instead, the instruction would come from them. We gave them a choice of four informational reports that we found on the internet, reports that we felt were solid mentors of the expectations of the fifth grade Common Core. The reports that we used are linked here (this one is a fourth-grade piece, but worked well for our purposes), here, here, and here. I'm going to take a moment to give a quick shout-out to Mr. Bowen in Oklahoma because his website is an incredible resource for samples of student writing! Armed with the information writing checklist from Writing Pathways and an informational writing mentor, our students broke into small groups or partnerships. They were charged with the task of reading their mentor to identify strong information writing characteristics and craft moves they could teach their classmates. 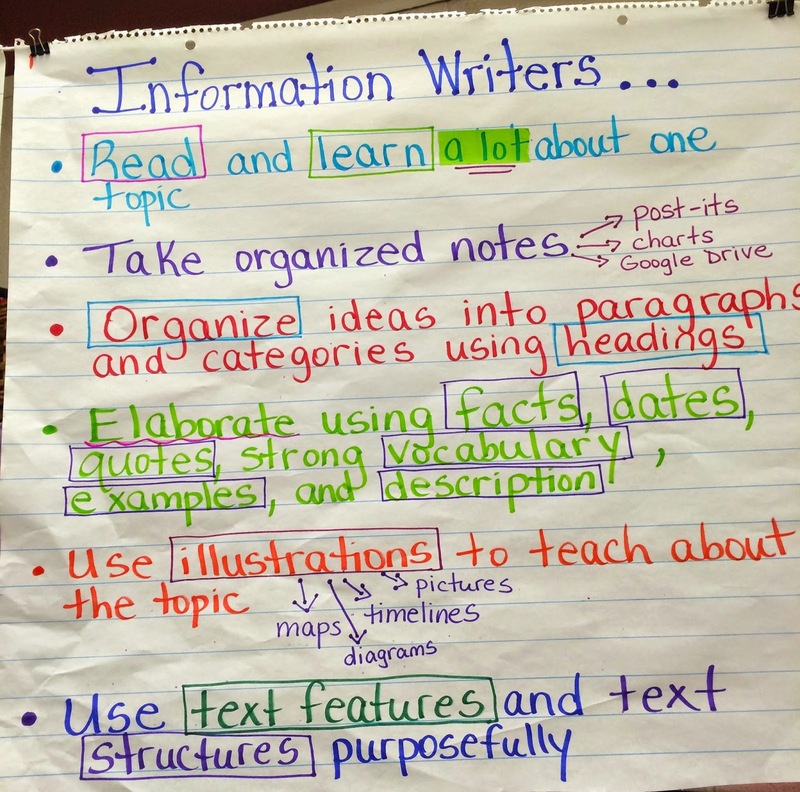 Below is a photo of the informational writing checklist found in the Writing Pathways book published by Teachers College Reading and Writing Project. None of the informational reports were long, so students were able to read them several times with different lenses. Voice was important to the students and they were critical of these pieces for not having enough independent thinking incorporated into the writing. "They just give facts," one student said. "If they used more of these transition words, then they would automatically have more of their own thinking," another noticed. "Their introduction isn't clear and it doesn't make me want to read it," another partnership shared. During the last fifteen minutes of the sixty minute workshop, each group presented their findings under the document camera, sharing the rationale for their checklist designation and the advice they would offer the writer. As they presented, I created the following chart, wanting to emphasize the skills that they already learned in the narrative units and how they could transfer them to informational writing. Mel and I had a chuckle at the high expectations they had for unknown writers! If they could produce anything close to these mentors, we'd be happy! The chart is displayed in our classroom as a great reminder for students of what they think the mentors should have included and what they should include in their own informational writing. The students actively use this chart when reflecting on their own writing to make revision decisions to make their writing even stronger! 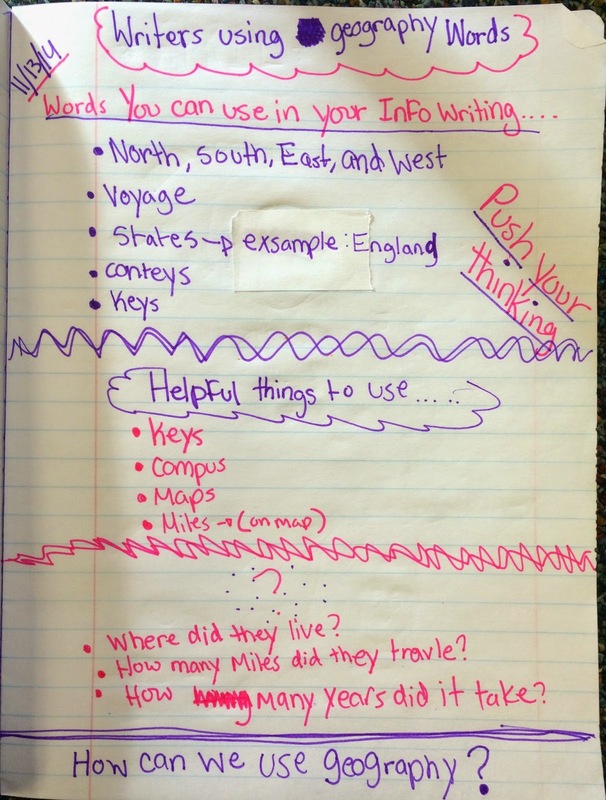 This inquiry lesson not only helped give our students a clear picture in their mind of what informational writing looks like and how it compares to narrative writing, but gave them the opportunity to actively discover the characteristics and expectations of informational writing and teach their classmates. Stay tuned to hear more about this informational writing unit and how we have continued to incorporate inquiry lessons and even flipping lessons with videos during the unit! We are extremely fortunate in our district because we get to have Teachers College Staff Developers come to out schools several times a year. Emily Smith, @EmilyJBSmith, joked with me yesterday, as I was taking fast and furious notes during one of our sessions with her. "Are you going to tweet that out?" she asked. "I just might," I answered. As I watch kids in a conversation, it's like they are having a competition and not a conversation. How true is this for not only kids, but also adults! How often do we actually nurture and grow ideas, as opposed to just wait to say what we have already decided to say! Ask your idea in terms of a question and you will end up in more of a conversation. I can't wait to try this. Instead of saying "Henry Hudson was a more peaceful explorer than most of the Spanish and Italian explorers," try saying "How was Henry Hudson a more peaceful explorer that most of the Spanish and Italian explorer?" Instead of saying "Mercy Watson was a seriously greedy pig," say "In what ways was Mercy Watson a greedy pig?" Creating atmospheres where students learn to grow knowledge is so important. I'm looking forward to using this technique to help students learn to listen to each other and see their classmates as resources to push their thinking and deepen their understandings throughout the curriculum and beyond. The second and third-graders of our district move from a personal narrative unit into a realistic fiction unit. Several lessons at the beginning of our current Realistic Fiction unit involve developing their character. They are supposed to draw their character, think about the inner traits as well as the outside characteristics. Then they are supposed to think about problems that their character could have. Basically, the curriculum gives students several days off of writing. One of the second-grade teachers and I decided to try starting the unit off differently, presenting students with a circular anchor chart. Then, I showed them how I had used them, introducing them to my character, Annie. Instead of thinking about the problems Annie could have, I showed them how thinking about the places Annie hangs out in leads me to think of stories about her. The chart that I am sharing I actually hand-wrote out, but I left it in the classroom, so I have typed a version out. What I wanted students to realize was that one character in one setting could lead to SEVERAL stories. Since our second-graders don't have writing notebooks, I gave each student their own chart to fill out. If I had been teaching this lesson in third-grade, I would have had the students make a chart in their writing notebooks. One of my favorite stories was by a personal narrative struggler whose character couldn't find the right shirt at Justice. Another favorite that I watched come to life was about Sam who didn't like shots at the doctor's office. I have written about the power of starting with settings when you're trying to come up with ideas and again, I have to say, this strategy aims students at small moments with clear story arcs. I don't want to sound like the stories were perfect, but I'm a big believer in volume. If I get a chance to teach this lesson again, I would remind students of the planning process that they learned during the Personal Narrative unit and encourage them to complete that step before starting to write their story. However, I strongly believe ( and have seen a lot of evidence that) when young writers write a lot of stories, the revision process becomes less of an event, and more of a continual practice. One of my daughters has always loved Patricia Polacco books, so when I saw her newest one on the library shelf on Saturday morning, I brought it home for Cecily. Fiona's Lace is classic Patricia Polacco, weaving history and family saga together in a way that teaches readers and leaves them with a lump in their throat or even a tear. Fiona, Patricia's great-great grandmother, and her family left Ireland in the 1800's to find a better life in Chicago. Instead, they found more struggles and eventually lived through the Great Chicago Fire. Expect the strong family bonds, symbolism, and the beautiful language that exemplifies Patricia Polacco's books. You won't be disappointed. I also picked up With Books and Bricks by Suzanne Slade with pictures by Nicole Tadgell. A lovely narrative about Booker Washington's struggles to first attend school and then build a school, this book is a wonderful example of narrative nonfiction as well as a book full of themes of perseverance, resilience, and growth mindset. Moses, the True Story of an Elephant Baby by Jenny Perepeczko is a book that will delight young and older elementary students. The photographs of Moses with his more typical domestic friends are adorable and the stories about his adventures and misperceptions about the human world are funny and entertaining, although older readers will pick up on the underlying sadness of Moses's plight; he was orphaned due to African poachers on a quest for ivory. Jenny Perepeczko slides in many facts through the engaging text features, craft moves that could definitely inspire and mentor apprentice information writers! I have been keeping my eyes open for nonfiction books that inspire more creative approaches to teaching informational writing and I loved Stay: The True Story of Ten Dogs by Michaela Muntean! This book has wonderful short stories about each of the dogs that weave in the information, serving as a fabulous mentor text for how narrative writing can be informative. In addition to being a mentor text, this book is also full of lessons about resilience, growth mindsets, and overcoming odds. One of my favorite lines is "Luciano found a way for all of the dogs to do what they did best." What a world it would be if we could substitute the nouns in this sentence! Miracle Mud by David Kelly is also a fabulous mentor text for narrative nonfiction as well as a springboard for talking about perseverance, creativity, innovation, and growth mindset. Lena Blackburne wanted to be a professional baseball player, but his miracle mud was his ticket into the baseball Hall of Fame. In addition to the text and the themes, this book also offers many opportunities to study the power of grammar and punctuation. David Kelly includes ellipses, dashes, quotation marks, and many forms of end punctuation, as well as varied sentence structure, parallelism, and purposeful repetition. This is a book that all students will enjoy! One of my missions for the year is to develop high impact lessons that address the Common Core Language Standards and The Grammar Plan Book by Constance Weaver has been a great resource. Citing specific picture books and texts, she describes workshop oriented lessons that show students the skills, how to use them, and offers practical and explicit instructional strategies for the transfer and integration of these skills in student writing.